Réigiún is ea Sasana Thoir i Sasana. 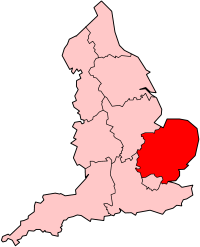 Is iad Peterborough, Luton agus Southend-on-Sea na bailte is mó ann. Tugadh an leathanach seo cothrom le dáta an 19 Iúil 2014 ag 11:04.